Digital panoramic tomography is widely used for the initial imaging of the entire oral and maxillofacial area. This is achieved through the CCD technology (Charge-Coupled Device, CCD). Quick diagnostics reliable and precise. 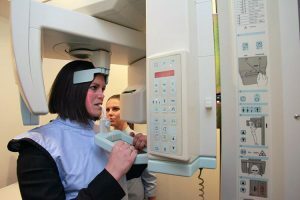 As with the conventional system, the patient positioning system and automatic exposure control (AEC) enable you to easily and reliably create x-ray images of superior quality. Digital imaging involving a very low patient dose also optimises the immediately available diagnostic results. A positioning system with three laser light beam localizers is used as the basic tool for efficiently adjusting the head according to anatomical standard parameters with support from the fully motorized adjusting functions. Maximum positioning precision is the result, even under difficult circumstances. For maximum diagnostic quality, the automatic emission control comes standard with all Orthoralix 9200 DDE units. The sensor detects the incident x-ray dose and corrects if necessary the selected, programmed exposure data to correspond to the actual absorption by the patient. This yields a balanced, optimum ratio of optical density and contrast in the x-ray. The emission control is available for panoramic projections and teleradiographic projections.